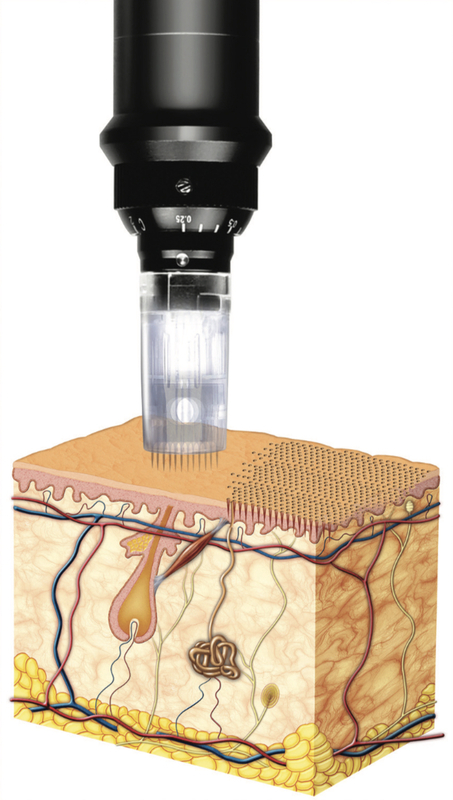 Welcome to the product information page for the Dermafix microneedling pen by leading skin care brand, Genosys. Skin health solutions are proud to deliver this amazing device to the best skin clinics and therapists in the UK. Genosys is a world leading South Korean brand. South Korea is very highly regarded for it’s advances in aesthetic skin care which is why this cutting edge microneedling technology can set you apart from the crowd in your aesthetic business. What is a microneedling pen device? Microneedling Pen’s use sterile needles to create microchannels in the surface of the skin which allows powerful skin rejuvenation products to penetrate the skin further while also stimulating the production of collagen. The Dermafix microneedling pen can create over half a million microchannels during a 5-10 minute treatment, penetrating deeper through the epidermis. This encourages the absorption of active ingredients making it far easier for them to pass through the upper layer to cells deeper in the skin than a simple surface application with no needling would. To be able to safely treat a client with microneedling you need to be fully qualified with an accredited training company. Without this training, you cannot get insured to administer the treatment. Most training companies will require a level 3 in beauty therapy or an equivalent to be able to train. This minimum requirements also covers doctors, nurses, dentists etc. Skin Health Solutions are partnered with Emma Coates Aesthetic training who deliver a professional and high quality training that has obtained 100% five star Google and Facebook ratings. If you’re interested in more information then visit their microneedling training information page here or the button below. 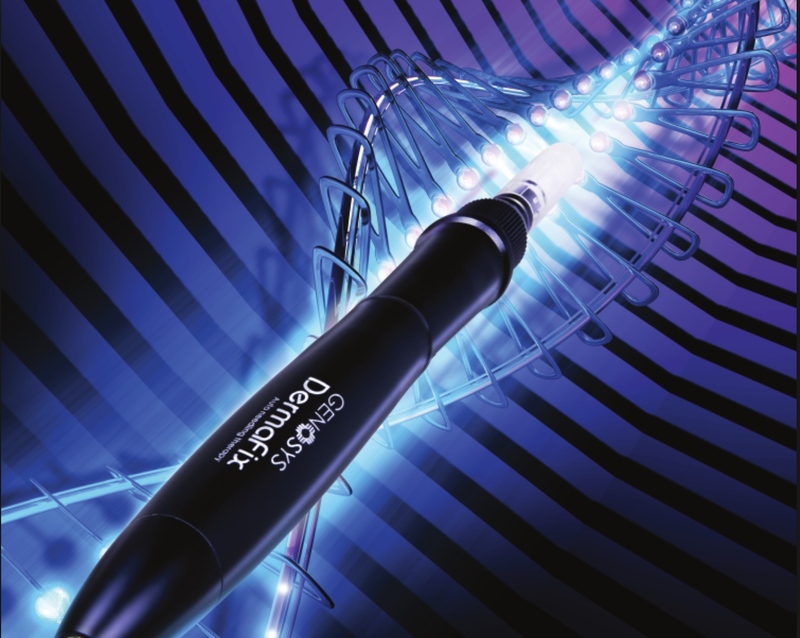 Why the Dermafix automated pen? – Verticle needling creates less damage as it does not bend or break the skin resulting in less bleeding, pain and therefore quicker recovery times. A topical anaesthetic is not necessary as the procedure is relatively comfortable. Treatment time is thus reduced and cost of anaesthetic is negated. How does the microneedling device works? 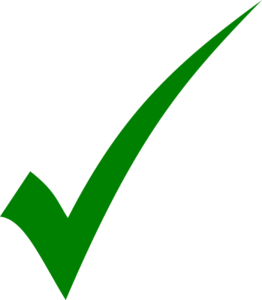 Multiple needle lengths per treatment: 0.25mm-2mm. Being able to adjust the needle length delivers a more targeted treatment, ie shorter needle length for more sensitive areas (eyes and top of lip). Speed adjustment, stamping repetitions of 1-9 mean the ability to bespoke the treatment according to your client’s needs. Dermafix is a corded device meaning it will never run out of battery or charge halfway through a treatment. Each device comes with a 6 month warranty. 16 sterilised needles per cartridge. Cartridges are competitively priced compared to other pen devices and compared to dermaroller. Use with Genosys Power Solutions for best treatment outcomes.